Miners from across the country marching down Market St. in downtown St. Louis. 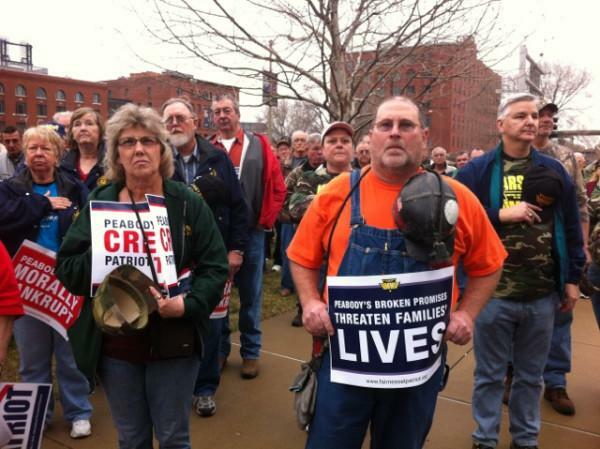 They are protesting a Peabody Energy/Patriot Coal plan to cut pension and health care programs following Patriot's bankruptcy. Miners stand in protest in St. Louis. 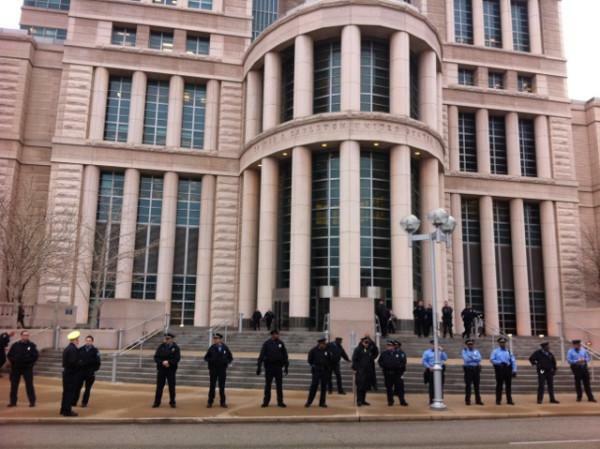 Police officers in front of Eagleton Courthouse in St. Louis during the protest. To compound the matter, in 2008 Patriot went on to acquire another company—Magnum Coal, at the time a subsidiary of Creve Coeur-based Arch Coal. For the first few years Patriot was profitable, but not for long. 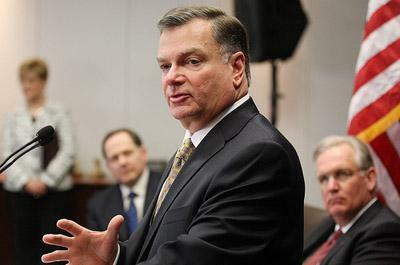 The company is now in the midst of filing Chapter 11 bankruptcy and is expected to ask a federal judge to release it from some of these outstanding pension and healthcare burdens. A judge moved Patriot's case to St. Louis last November. An $802 million financing package is letting it continue operating while it restructures. Cecil Roberts, President of the United Mine Workers of America, says the whole deal was designed to end up in bankruptcy court. “So now Patriot is paying the obligations of two of the largest coal companies in the world and people who never worked for Patriot are asking me…how can Patriot going into bankruptcy have anything to do with my healthcare?” says Roberts. Most of the retired miners in question never worked for Patriot Coal, people like Orlis Milton from Greenville, Ky.
Peabody spokesman Vic Svec said the matter is between the union, Patriot Coal, and a judge—not the court of public opinion. Many of the retirees in question live in the states of West Virginia, Ohio, Illinois and Kentucky. The St. Louis Police Department deployed approximately 75 officers to monitor the protest and stand outside of the Eagleton Courthouse as well as Peabody’s headquarters on Kiener Plaza. Ten members of the UMWA leadership protested by sitting in 7th St. at which point they were arrested without protest. Adam also appeared on St. Louis on the Air earlier today, calling in live from the protest. Below is the audio of that appearance. 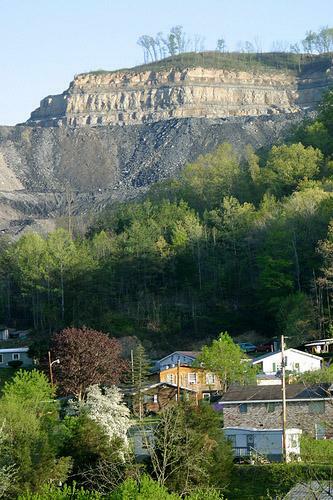 Bankrupt Patriot Coal will become the first U.S. operator to stop large-scale mountaintop removal mining in Central Appalachia under a historic agreement with three environmental groups. The deal was struck Thursday and presented to a federal judge in Huntington, W.Va. It stems from pollution lawsuits filed by the Sierra Club, Ohio Valley Environmental Coalition and West Virginia Highlands Conservancy. 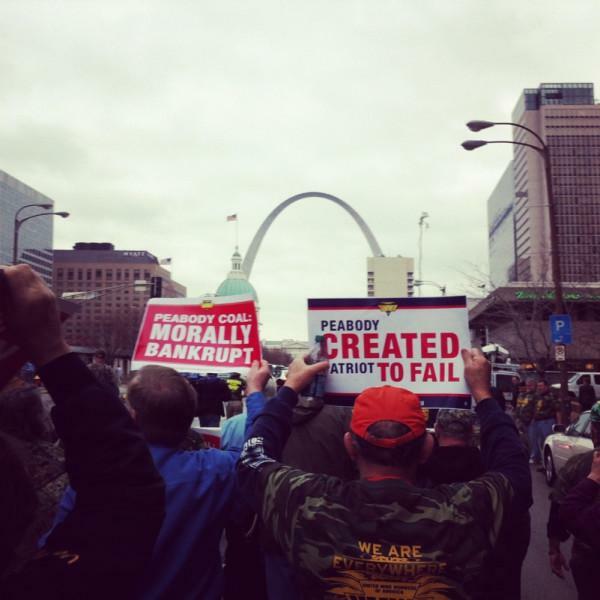 Local activist groups say they’re planning several protests this week against Peabody Energy. Later in the day, activists joined student groups to protest at Washington University, saying the school had too cozy of a relationship with Peabody. In a statement, Washington University says it respects students’ right to express their opinions.